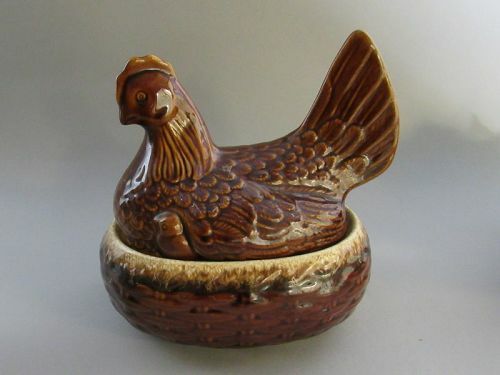 Vintage Hull Pottery brown drip glaze covered cassarole dish of a hen with a chick on each side nesting on a basket weave nest. In excellent condition, it measures 8.5" high, 8.5" long, 6" wide. 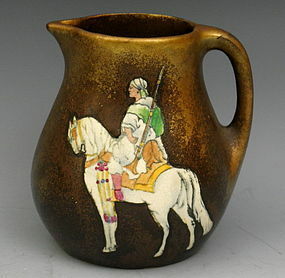 Circa Austrian 1920, Teplitz Stellmacher pottery character pitcher. Colors are great and it is in excellent condition. Measures 5" high. A rare Kay Finch cat standing at 10.5 inches tall . 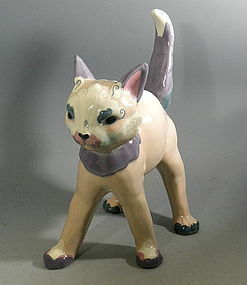 In perfect condition, she is 9" long and is stamped "Kay Finch" on the bottom of a back paw. A fantastic piece for the collector. 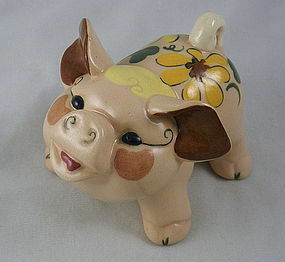 Very cute Kay Finch pig with brown ears and a yellow flower on her back. Hand painted and in excellent condition, it measures 3.25" high by 4.5" long. 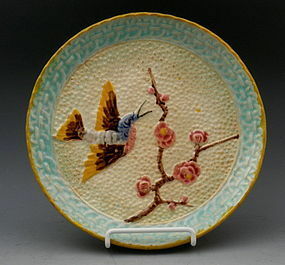 Circa 1885, majolica plate with a bird in flight and a cry blossom branch in bloom. Measures 8.25" diameter. 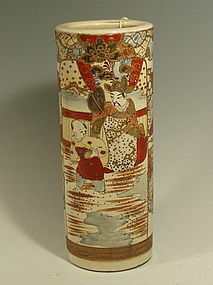 A fabulous Hedi Schoop art pottery fan vase. 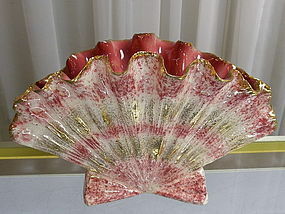 The exterior features a metallic gold, white, and fuschia or brilliant rose palate. The scalloped edges are trimmed in gold which creates a stunning contrast to the brilliant rose interior. Heidi Schoop Art Creations of North Hollywood, California date from 1945 - 1954 but her works were much sought after even before she started her studio. In excellent condition, it measures about 7" tall by 11.25" across. 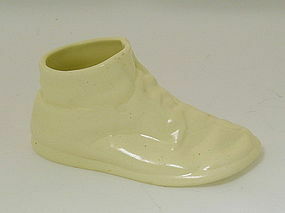 A vintage Metlox California pottery off white baby shoe. 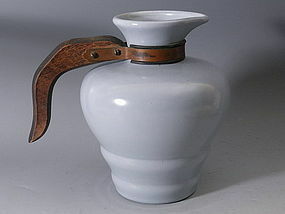 Could be used as a little vase for violets and pansies or a small planter. Signed on the bottom Metlox 47C Made in USA, it is in excellent condition and measures 2.75" x 5". This is a right shoe. 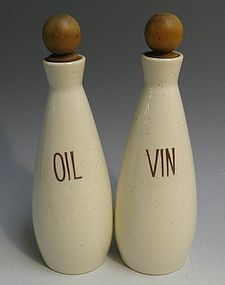 A hard to find 1940's Vernon Kilns, Beverly, double server. Would make an excellent candy dish. 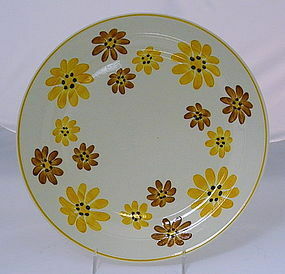 Hand painted and in very good condition, it measures 4.25" high x 11" long x 4.25" wide. There is very small old chip that looks more like wear on one end (photos with measurements available). Hard to find Metlox Mission Bell P622 pitcher in satin finish powder blue. Circa 1930s, it is in excellent condition and measures 7.5" high x 6" in diameter at widest point. 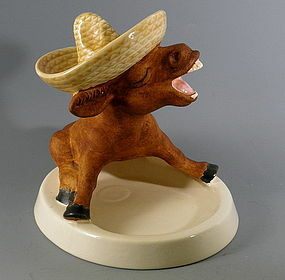 Spout 3 1/8"
Rare piece of California pottery Metlox Artware. This little donkey is one of a series of "Animal Keepers". Designed with a shallow dish with plenty of room for keys, change, a wallet, pencils, pens, jewelry, etc. This piece was also designed so that wrist watches could be put on his hat. It is in excellent condition, and measures 7" high x 6.75" across x 7.75" deep. 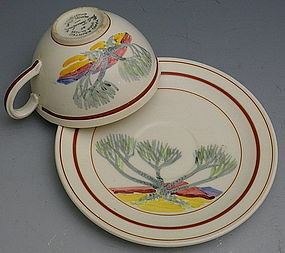 RARE Vernon Kilns of California cup and saucer by artist Gale Turnbull. The design is hand painted by the artist and called Smoke Tree. 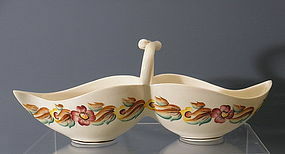 In excellent condition, the saucer measures 6.5" across, cup measures 4" diameter. Cup and saucer measure 2.5" high. 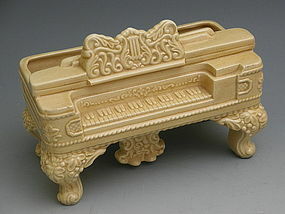 A large mid century California Metlox baby grand square piano planter In excellent condition with just 2 small areas of very minor abrasions at the front corners. Marked on bottom "Metlox Mfg. Co." "Copr. 603", it measures 8.5" wide x 5" deep x 6" high. 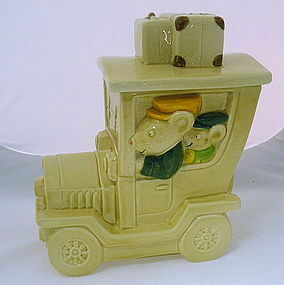 A beautiful slightly golden cream color with excellent detailing, this would be a fine addition to any Metlox or California pottery collection.